Note: image is litter-brother BryanStam's Granito Grazieson. 2 - 2.............Bryan von Forell. 3 - 3.............Vello von Fürstenfeld. 3 - 3.............Kira von Romberg. 3 - 3.............Hella von Forell. 4 - 4,4..........Bingo vom Dornberg. 4 - 4.............Ilka vom Romberg. 4 - 4.............Citta von Fürstenfeld. 4 - 4,4..........Bordo von Fürstenfeld. 5 - 4,5..........Carmen vom Felsingpass. 5 - 5,5..........Inka von der Nordburg. 5 - 5,5..........Tell von der Priorei. 5 - 5,5..........Goldine von Sandfontain. 5 - 5.............Amor vom Moselland. 5 - 5.............Hella vom Romberg. BryanStam's Gräfin Graziedotter was a well bred female with a solid character coming from Lilith Edstrom's BryanStam kennel in Sweden. She was linebred 2-2 on Bryan von Forell (Vello von Fürstenfeld x Kira von Romberg). Gräfin Graziedotter was imported into the Netherlands where she became the foundation female for the 'van Rensloo' Kennel. Her dam, Gravin Grazie, had an excellent character and passed the Körung in Sweden. Bonita: SchH 2 and passed the Körung with Körklasse 1A rating. She is dam of the van Hermansjomaik “A, B, C, E, F, G” litters (Arjanne, Atleet, Emir, Esmir). 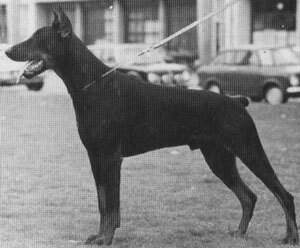 Baron Cecar: SchH 3, FH, DVIN-Leistungssieger plus winner of numerous show championships. He is sire of the vom Harro's Berg “B” litter (Baron Bryan). Barones Eva: SchH 2 and dam of the van de Groote Maat “A, B, C, D, E, G” litters (Baroness Cleopatra, Ebo, Goliath).